6:00 I leave the hotel in Milano. The day before I walked through Milano and was impressed. I have to come back for a closer look. See pictures. The Metro in Milano opens at 6am. I miss the bus at 7am. It is sooo cold and icy. I take the 7:45 bus to Crema. The distance between Crema and Milano is only 50 km but the bus stopped at EVERY busstop so it takes me 1.5 hours. 9:30 I arrive at the university campus in Crema. The Dipartimento di Tecnologie dell’informazione is a part of the university of Milano. At this time they had an old intranet. They used it from 2000 to 2008 with 150 authors/editors and 3800 users. In 2009 they decided to use a Drupal based Intranet called Altana. It is build by Paolo and Pietro, they are employees of the Comune di Venezia. It took them 6 month to plan, build and switch from the old to the new intranet. An important detail was the phonebook. One problem was the design of backoffice. How to handle 150 authors? Finally they used node access to set access rights on node level. The room gets fuller and fuller :-) The last questionS were asked about the venice project. There is a lot of interest in the different possibilities with prebuild modules afterwards. 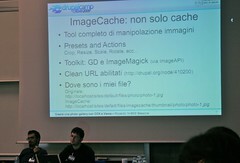 He shows the possibilities of ImageCache and builds a gallery using the usual subjects, cck, views, imagecache, imageapi and the modules custom pager, taxonomy redirect. For the gallery names he used a vocabulary. 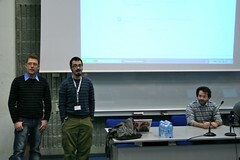 The presentation was very professional. I know the module, so I could follow the slides but I didn’t understand the hints and tipps. View more presentations from claudio.cicali. He runs the website http://civiccrm.eu. He talks about the history of the project since 2005, the core, that is available for Joomla and Drupal and lot of other useful things concerning civicrm. 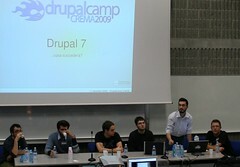 Drupal 7 presented by the drupalitalia team. 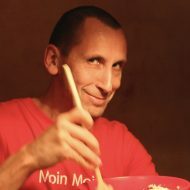 My Impression about Italy and Drupal? 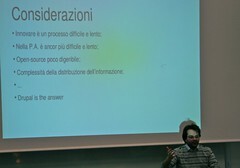 Drupal appears slowly on the italian horizon. There are many interesting italian projects like the intranet of the Venice Community, which are completely in italian language and will not that much be known outside of Italy. There are many web agencies which start to think about Drupal. Mostly they try it in a small project. The coolest project I have seen is a Drupal Implementation on IBM AS400, done by Jet, a company based in Seregno -> Congratulation. As far as I have seen, Italy is not that “twitter- and web 2.0 compatible”, they are more focussed on mobile phones -> Pronto?. I was wondering why there was no talk about the mobile possibilties of Drupal. 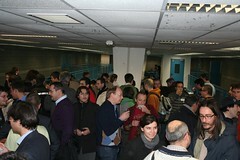 I am sure, when the right people will notice the real potential of Drupal the Italians will love it.